I had – rather optimistically – decided to begin with the first couple of projects on the Five Year House-Improvement Plan at the beginning of the year, before the Daughter Unit even left for California. 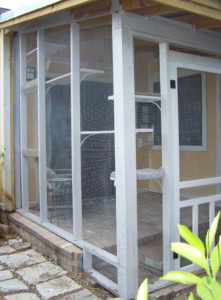 I had hoped to see the Catio done early in spring, and the small bathroom completed in the time she would be away. 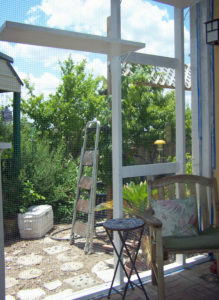 As it turned out, those two projects and the new roof as well, were all done in a rush, throughout the crowded month of May. However – I cannot make any substantial move at the next projects – that is, a new garage door, and renovating the master suite bathroom until the roof and the Catio are paid for. This will take until late fall; the company I contracted with is being enormously generous about this. There are some advantages to being one of the company owner’s old neighbors, and a previous customer vis-à-vis a roof that had to be replaced in 2004 after the mother of all golf-ball-sized hailstorms. Also, I have lived in the house since 1995, and it is just not something that one can hitch up and take to another state. And I have rebuilt my good credit rating … All that helps enormously. But the remaining projects will all be done on a ‘me buy the materials and have Neighborhood Handy Guy do the work’ basis or paid up front to a specialist. I’d rather not refinance, as I only have two more years to go until the mortgage is paid in full. We will not be sitting on our hands in the meantime, though. The rest of the garage needs to be cleared out and reorganized. A lot of stuff from the Daughter Unit’s hold baggage is still out there, plus some odd bits of furniture. Some of the furniture I was holding onto with a thought for eventually furnishing a Hill Country weekend retreat, or possibly the Daughter Unit’s separate establishment. Having concluded that neither of those things is likely to happen, may as well have a good clear-out. We already did a run to Goodwill with the first installment of “Stuff No Longer Required.” There will be a good few more trips, as we clear away even more. The embarrassing thing is that we do have empty shelves and spaces along the walls … but we can’t get to them for all the stuff piled up in front! When the garage is cleared out enough that they can get in to replace the door, I’d like to be able to keep at least one of the cars inside, as well as the pavilion and the market-event things, rather than have to haul them back and forth from the shed in back. The Daughter Unit wants to be able to have a workspace in the garage for doing stained glass, since she brought home all the stained-glass tools that Mom used in her studio. I’d guess we have most of the summer to get this done. 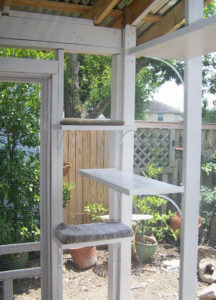 We might very well have a small glass window and an AC unit put in, to make the space a little pleasanter for working in. And then there is the renovation of the master bath, to plan and consider. I want a vintage Victorian look, with tiny hexagonal times on the floor, blue-figured wallpaper and antique-looking fixtures. All in good time … all in good time.